The emergency of poverty is taking over a land without defences. This is what is happening in the Free Territory of Trieste under temporary administration of the Italian Government. Here, the drama is even more painful by the necessity of Italian authorities to cover a situation that is caused by nothing but their own mismanagement. A mismanagement granted by the collaborationists, local politicians and turned into an ongoing predation of the properties of the State under trusteeship, continuing for decades at the expenses of the citizens under administration and of the whole international community. This is how the Free Territory of Trieste was turned into kind of a modern colony, where the only modern aspect is the mean used by the State of Italy for the spoliation of the citizens of the Free Territory of Trieste from all of their wealth, making them the new slaves of the post-Fascist Republic of masonic mafias. Revenue Agency, Fiscal Police, Equitalia, Customs Agency, they are the perpetrators of this international crime. Obviously, with the covers of judicial authority, which is here of the interests of the occupying State, being its controller and guarantor. Impoverishing Trieste does not only consist in taking goods away from its citizens by forcing them to pay undue taxes and the robbery committed removing the whole State property – transferred to the State of Italy arbitrarily – of the Free Territory of Trieste, but also when it comes to the annihilation of development opportunities in the place that could have become the main economic exchange area of Europe, with this area transformed in the meaningless, degraded suburban of Italian corruption. 40,000 Triestines are forces to emigrate to escape poverty. 50,000 Triestines are on the edge or below the level of poverty. One Triestine out of three is in this condition. This is the result of 60 years of Italian administration. And administration which, by its own misgovernment, has destroyed the Free Port of Trieste and wasted hundreds of thousand of billions of Euro and dozens of thousand of jobs. While municipal police intensifies the fight to beggars, who are just the citizens who were abandoned to their own fate by the institutions that should have protected them, the anger of the folk of the ones marginalised increases. And, along with it, the will to redeem themselves from this illegitimate and strictly mafia-like administration. Last year, the Free Trieste Movement launched an alarm on this outbreaking situato that involves more and more people. The complaint of Free Trieste to the Italian Government and to judicial authority, for an urgent intervention to protect the citizens who are starving and desperate, for being abandoned by local public administrations, yet, there were no answers, and no actions were taken. Follows an abstract of this complaint, which emphasizes the responsibilities – and the criminal liabilities – of the provisional administrators of the Free Territory of Trieste. Take note that, despite warning all city councillors of the Municipality of Trieste, none of them considered it necessary just a mere answer. As if ignoring it solved the problem. The humanitarian emergency in the Free Territory of Trieste is about to explode. 5. Trusteeship of the Italian Government and social assistances. The entrusted administrator is bounded to fulfill the duties od a good government even as for the rightful and fair distribution of social assistances, which have the double purpose to grant vital needs, social dignity and the fundamental rights of persons facing poverty, as well as reverting the recessive, economic spiral caused by the increasing impoverishment of the citizens under the survival income defined on the grounds of minimum consumes for daily needs. − accompanies the efficacious distribution of social assistance with the highest possible valorize the possibilities for the economic and professional development of the community. Recommendation CEE No. 441 of 1992 has adopted, among European criteria of social protection, also the principles of basic income. As for basic income for citizens and when it comes to the Free Territory of Trieste, we mean a public, monthly additional amount of money, granted and regularly provided to all residing citizens over the legal age, if and as long as they have no income deriving either from a job or a pension that would possibly grant their ordinary, daily needs in regard to the actual costs of essential goods and services. A controlled distribution of basic income grants a feedback of constant balancing of the economic and social system; the expense is compensated with the increment of collected consumption taxes and by the reduction of the intrinsic costs of fragmentary social assistance. Due to this, basic income is suggested by the EU and it is already assigned, by different means, in nearly all States of western Europe, the only exceptions being Greece, Italy and the Free Territory of Trieste, entrusted to the Italian Government. The powers of special, trusteeship administration assigned to the Italian Government allow it to extend, at any time, within the legal system of the Free Territory of Trieste basic income as well as any other social assistance, regardless to the legal system of the Italian State, as that is a third State. Since decades, the Free Territory of Trieste is undergoing an increasing, artificial impoverishment, which is not caused by cyclic crisis of general economy, rather, that is caused by harmful actions of the Italian Government, entrusted with its administration. The administering Italian Government does actually violate the international mandate, simulating the sovereignty of the Italian State over the Free Territory, despite that having ceased at the coming into force of the Treaty of Peace of Paris on September 15th, 1947. By simulating that, the administering Italian Government does illegally subjects the Free Territory and international Free Port of Trieste to the direct enforcement of Italian laws, including these concerning ports and undertakings, employment, and taxation, which are some of the most burdensome in the world and violating, under different perspectives, the fundamental rights to work, fair retribution, equal taxation and other social protections. d) it currently gives back to the administered Free Territory about 10% of the earnings that, by committing illegal actions, it has either subtracted or prevented. These severe violations of the trusteeship mandate committed by the administering Italian Government do illegally force companies and people of Free Territory to face obstacles as for both law and taxation as well as the unemployment levels and the poverty of the failing economy of the State of Italy, yet, non of this is compatible with either the potential and special economic needs of a City-State with an international Free Port. 8. Obligations of the administrators of the Municipality of Trieste. Despite the simulation of Italian sovereignty, which does no longer exist since 1947, the bodies of the Italian State grounded within the Free Territory of Trieste by the administering Italian Government do, de facto and exclusively, fulfill the functions of bodies of the entrusted administrator. Due to this, these are as well bounded to respect the functions, powers and provisions following from this mandate, as well as to respond to administrative, civil and criminal justice. As already stated at paragraph 4, the actions of social assistance in the Free Territory of Trieste are an administrative obligations and primary expenditure for all bodies delegated to fulfill these, regardless to the alleged sovereignty that justifies these. According to the principles of Italian legal system, extended by the Italian Government, entrusted with the administration of the Free Territory of Trieste «Municipalities are entitled of administrative functions concerning social action on a local level (…). Said functions are exercised by Municipalities by adopting, as for their territorial bases, the most suitable assets to manage expenditures and the connection with citizens (…).» (Law. 328/2000, Article 6. No. 1). The same principles establish that Municipalities act as autonomous bodies (Article 128 of the Constitution of the Republic of Italy) and their own responsibility: «Municipality is the local body which represents its community, takes care of its interest and promotes its development » (Law 142/1990, Article 2). Follows that there is no doubt that the Municipality is directly, exclusively and discretionary subject to the responsibility of establishing, as for its territory, the assistance its citizens need and to do that as an obligatory intervention and primary expenditure of each administrator; due to this, they are also liable for criminal, civil or administrative offences when it comes to the choices they either make or approve through their deliberations. 9.Violations of the obligations of the Municipality of Trieste and alleged offences. Also, there are reliable evidences (both documents and testifies of witnesses) of the fact that, despite the very severe social emergency affecting a very significant part of the citizens of Trieste, the Municipality, in person of the members of the current Municipal Administration, lead by mayor Roberto Cosolini, as well as by the previous two Administrations of then mayor Roberto Dipiazza, through their budgets, destined and keep destining to social assistance sums largely inferior to the needs and legitimate demands of the citizens. At the same time, these same administrators did continue to add to the budget significant amounts of money to be destined to secondary or unneeded expenditures and, by doing so, these are subtracted to the mandatory, primary expenses, which are related to the constitutional duties as for social assistance. 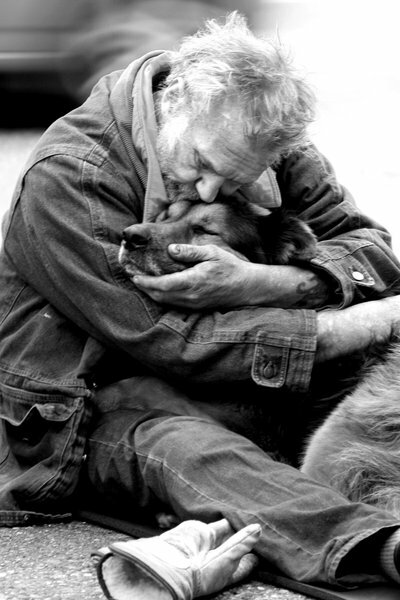 The consequent refusal to provide economic assistance to citizens in need, supported with the argument that there would not be money for that in the balance causes severe damages to the ones demanding that, as this way they are unable to pay their rents, services and other assistance and, even, some of them cannot buy food for themselves and their families, falling into tragic situations, which do often lead to illnesses or drive them to extreme actions, up to suicide. 1. 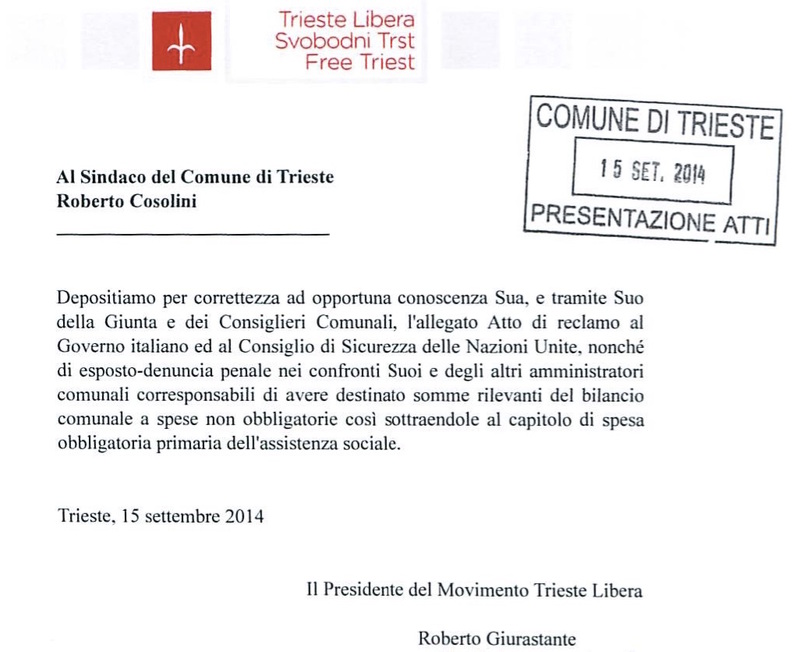 Demands to the Italian Government, entrusted with the administration of the Free Territory of Trieste to take care of regularizing, within six months, the regime of trusteeship administration as for the severe social emergencies affecting the citizens of Trieste, as well as granting to them, for this purpose, a basic income. 3. Notifies to the Prosecutors Office of the Republic at Trieste, considering this as a complaint-report versus mayor Roberto Cosolini in regard to the aforementioned facts and alleged violations at paragraph 9 and versus the assessors and Councilors of the Municipality of Trieste that might have had a complicity to that through deliberations, even when it comes to budgets.